1) Updating-Refresher Training for STCW – All Seafarers. 2) Requirements for Deck & Engineering Yacht CoC Applications. 3) Seafarers revalidating their Certificates of Competency (CoC) after 31st December 2016. 5) Changes to Yacht Service Verification Process. MIN 543 – Sea Service Verification on Large Yachts. Proficiency in Fast Rescue Boats. Port State Control can detain your vessel if your paperwork is not correct. If you hold the Advanced Sea Survival for Yachtsmen certificate, you can refresh this too. You can enrol on a refresher course either for the Advanced Sea Survival, or at a school that runs the PSC&RB refresher, but with the latter you will still have a limitation on the certificate (not valid for use on vessels with lifeboats launched by davits). The Advanced Sea Survival course is going to be re-named PSC & RB (Restricted) to avoid any confusion in future. In the same vain, if you hold the PSC&RB, and you can’t get to a school that runs the refresher course, you can enrol with a school that runs the Advanced Sea Survival refresher, but your PSC&RB will have the negative endorsement applied to it. This can be removed by doing the PSC&RB refresher at a later date. STCW permits some elements of the updating training to be carried out on-board ship (with the exception of Basic Fire Fighting). You can complete a self-declaration form, which can be found as an annex of MSN 1865. You must still attend an updating course at an approved training centre, but the courses are significantly shorter than the full updating training. ¹If you need to update your PSC&RB, you must also update the PST. The update of PST is required whether or not it was part of your original certificate training. ²If you need to update your Advanced Fire Fighting, you must also update Basic Fire Fighting. The update of Advanced is required whether or not Basic was part of your original certificate training. There are very few places remaining at schools worldwide, but we urge you to complete this training in time, as the consequences could be expensive. JPMA do not offer this training, but we will be happy to give guidance and point you in the right direction for your training elsewhere. Applicants for a Master <200 NoE must now submit proof of 6 months sea service whilst holding an RYA or IYT Yachtmaster Offshore CoC. All OOW Yachts and Master <200 candidates are required to submit a 3 day Human Element Leadership & Management (HELM Operational) course certificate, when applying for their CoC. Applicants for OOW Yachts CoCs will no longer automatically receive the Master (Code Vessels) <200 endorsement on the CoC. To obtain this endorsement on your OOW CoC, you must apply for a Master <200 NoE, and sit a separate oral exam. OOW Yachts applicants are required to undertake an Efficient Deck Hand (EDH) course when applying for their CoC. From 1st January 2017, this certificate must have been issued at least 18 months prior to the issue of your CoC. OOW candidates are required to hold an RYA Yachtmaster Offshore CoC (or IYT Master of Yachts <200gt). To obtain a YM Offshore CoC, candidates must have undertaken half of their qualifying mileage (1250 miles) on vessels <24 metres. For those candidates who have been working on larger vessels, this is a difficult goal to achieve. The MCA have announced that they will now accept Yachtmaster Coastal as an alternative to Yachtmaster Offshore. See this page of our website for further information. Chief Mate Candidates are also required to submit an ECDIS certificate when applying for their CoC. Master candidates are required to submit a 5 day Human Element Leadership & Management (HELM Management) course certificate, when applying for their CoC. Master candidates are also required to submit an ECDIS certificate when applying for their CoC (if this has not already been submitted with their Chief Mate CoC application). The Master Celestial Navigation exam is now required for issue of a Master CoC. The certificate must be no more than 1 year old when applying for the issue of your CoC. The exam pass certificate is all that is required by the MCA, but JPMA offers a refresher course prior to the exam, for those people who wish to brush up on their Astro Nav skills – see our Course Dates page. MEOL applicants are now required to submit proof of service on board vessels of 200kW or more in propulsion power. The length of service required has not changed. Y4 and Y3 candidates are required to submit a 3 day Human Element Leadership & Management (HELM Operational) course certificate, when applying for their CoC. Also, applicants are now required to submit proof of service on board vessels of 350kW or more in propulsion power. The length of service required has not changed. Y2 and Y1 candidates are required to submit a 5 day Human Element Leadership & Management (HELM Management) course certificate, when applying for their CoC. Y2 applicants are now required to submit proof of service on board vessels of 350kW or more in propulsion power. The length of service required has not changed. Y1 applicants are required to submit proof of service on board motor vessels of 1500kW or more in propulsion power and at least 500gt, or on board sailing vessels of 1500kW or more in propulsion power and at least 1000gt. The length of service required has not changed. NOTE: Being in possession of an NoE issued under the old regulations does not exempt you from doing these new courses. 3) Seafarers revalidating their Certificates of Competency (CoC) will be required to submit additional evidence to ensure their Certificate is valid for service on certain types of ships after 31st December 2016. Seafarers required to hold any of the above certificates of proficiency shall, every five years, provide evidence of having maintained the required standard of competence, to undertake the tasks, duties and responsibilities specified in the above stated tables. Seafarers revalidating their Certificates of Competency (CoC) after 1 January 2017 will be required to submit documentary evidence of having completed MCA approved updating-refresher training. There is no requirement to provide documentary evidence for having completed updating-refresher training if a seafarer applies for CoC revalidation before 1 January 2017. From 1 January 2017 Port State Control Officers may require seafarers to provide documentary evidence of having maintained the required standard of competence, to undertake the tasks, duties and responsibilities listed above. Presenting the documentary evidence obtained on completing an MCA approved updating-refresher course will meet this requirement. The 2010 Manila Amendments to the STCW Code bring in the requirement for Deck Officers working onboard ships fitted with an Electronic Chart Display Information System (ECDIS) to undergo specific education and training. As of 1 January 2012 seafarers requiring revalidation of UK CoCs issued in compliance with STCW Regulation II/1, II/2 and II/3 (maintain a safe navigational watch; use of ECDIS to maintain safety of navigation; and maintain the safety of navigation through the use of ECDIS and associated navigation systems to assist command decision making) need to comply with the new STCW requirements to ensure their CoC remains valid on ships fitted with ECDIS after 31 December 2016. • ECDIS simulator training course in compliance with IMO Model Course 1.27, accepted by the MCA and approved by an Administration whose CoC the MCA accept for the issue of a CEC. “From the 1 January 2017 this certificate is not valid for service on ships fitted with ECDIS”. 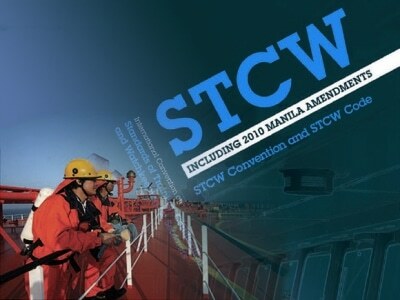 The 2010 Manila Amendments to the STCW Code bring in the requirement for engineers to undergo education and training in High Voltage systems, at both the operational and management levels. This requirement comes into force on the 1 January 2017 but will affect the revalidation of Engineering Certificates of Competency (CoC) from 1 January 2012. There is no requirement for additional training to be undertaken by all existing Engineer Officers, whether or not they intend to work on ships having High Voltage systems. However, High Voltage training requirements will be incorporated in the future training programmes of Engineer Officers at both the operational and management levels. “From 1 January 2017 this certificate is not valid for service on ships fitted with High Voltage (over 1000V) systems”. Engineer Officers who do not want this limitation placed on their CoC should read the following section applicable to their Certificate. Note: A High Voltage (over 1000V) system is where voltage is generated and distributed at high voltage or transformed to and distributed at high voltage. It does not include systems where high voltage is utilised locally e.g. ignition systems, radio transmission, Radar and other navigational equipment. • three months sea service during the last twelve months. Sea service evidence can be provided in the form of a company letter signed by an authorised official within the company. To avoid having the High Voltage limitation, Senior Engineer Officers will need to show compliance with 2010 Manila Amendments. In addition to the current revalidation requirements, they will have to provide documentary evidence of completion of High Voltage (HV) course (*). • Immediate actions to be taken under fault conditions. • Performing tests of insulation resistance and polarization index on high-voltage equipment. The original certificate and course syllabus must be submitted with the application. Engineer Officers may subsequently request the removal of the High Voltage limitation by providing documentary evidence of a High Voltage training course that includes the required topics. 4) Security training is required by all personnel employed or engaged on board ships to which the ISPS Code applies. These regulations came into force on 1st January 2014. • Proficiency in designated security duties (1 day course). NOTE: As all yacht crew are usually engaged in security duties as part of the ships security plan, it is strongly recommended that the 1 day Proficiency in Designated Security Duties course be completed, rather than the half day Proficiency in Security Awareness course. There are grandfather clauses which allow seafarers with previous equivalent training and those with relevant sea service prior to 1st January 2012 to be issued with a certificate of proficiency without undertaking further training. The MCA have recently formalised an arrangement with the PYA and Nautilus for them to verify all sea service before it is submitted with an NoE application. You do not need to be a member of either organisation to have your service verified, but there may be a charge for this service for non-members. MIN 543 details the requirements, but failure to have your service verified by one of these organisations prior to applying for your NoE will cause severe processing delays of around 160 days. MSN 1861 – Revalidating CoCs. Email mate@hss.ac.uk if you need more advice about these changes in requirements.